Wasps are similar to bees, except their sting is painful and they are capable of stinging repeatedly. This makes wasps dangerous to anyone with a bee allergy or with a weakened immune system. Below, we have outlined the types of wasps most often found around southern California. Mud Daubers: Mud daubers are a type of wasp that make their nest from mud. These nests are often attached to walls, eaves and ceilings. These wasps rarely sting people and often keep to themselves, however their nests are unsightly and many home owners wish to have them removed to preserve the structure. Paper Wasps: Paper wasps are about an inch and a quarter in length and make their nests from cellulose fibers from dead wood and plants. Their nests are water resistant and have a distinctive pattern, similar to honeycomb with no covering. These wasps are not typically aggressive, but they do build their nests in eaves and ceiling structures. Yellow Jackets/Hornets: Yellow jackets are half an inch to one inch long. They are usually black with some yellow markings. Yellow jackets make their nests in eaves, attics and sometimes underground spaces around yards. These wasps are often aggressive and will sting multiple times if threatened. Unlike honey bees, a wasp’s stinger is smooth, so they are able to sting more than once. Their stings are painful and can be fatal in some instances. Pest Innovations has state licensed and trained technicians that will remove wasp hives safely from your property. In some cases we offer a guarantee with our service. For more information about wasp removal, call us today. Wasp nests can take over a structure, seemingly over night. These nests are often found in the eaves around homes and businesses. Since many types of wasps aggressively protect their nest, this can make trying to enjoy your backyard or patio dangerous. If wasps are taking over your yard space, an expert Pest Innovations technician will come to your home or business to remove the nest. We will apply a low odor, low-toxicity pesticide to the affected areas. In some cases, we will work with your contractor to remove a hive, if the hive is in a wall space. 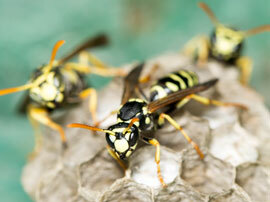 For more information about our wasp removal services, please give us a call!